2. There are just too many beauty products out there that promise to eradicate acne and completely fade past scars. However, most only do a short term cover-up job by temporarily plumping the skin or creating an illusion of smaller pores. As someone who had a blemish-free adolescence only to be hit by horrid cystic acne in my 30s, the path to clear skin has been long. And (pardon the pun) extremely bumpy. So, to really be able to comment on whether Avène hits the mark required more intensive testing than normal. The claim: This very gentle paraben-free cleansing gel is perfectly suited for young, oily, blemish-prone skin of the face and body. It purifies the skin and controls oil secretion without abrasion (no rebound effect). Its seboregulators and anti-bacterial key ingredients eliminate impurities and excess oil. Key ingredients like Cucurbita pepo help minimize excess sebum, while Avène Thermal Spring Water soothes the skin, leaving it clear, fresh and non-irritated. My experience: This fresh blue gel foams pretty well for a cleanser that’s 100% sodium lauryl sulfate (SLS)-free. Why is that important? SLS has a high potential to irritate the skin or worsen sensitivity. The downside is that most SLS-free cleansers don’t lather very well, which is a bugger. However, this one is foamy enough to use with my Clarisonic – a definite plus. I would say the Cleanance Gel is more suited to those with super-greasy skin as it zaps all the oiliness from my face for a good many hours. This makes it a little drying for my particular skin type, though it would be a blessing for anyone with really oily skin. The time I really bring out is on hot and humid afternoons, when one needs a power-packed punch of grease control. Another thing – even though this cleanser really cuts through the grime, it’s not that great at washing away makeup. For that, I have found it’s better to pre-wash with an oil-based cleanser or a makeup remover, then follow with the Cleanance Gel for a thorough cleanse. The claim: This paraben-free mask, which turns into a scrub, eliminates impurities and tightens pores – a three-in-one way to perfect skin! Enriched in soft clay and vegetal key ingredients, this mask absorbs excess sebum, while its micro-particles unclog your pores gently, giving your complexion clarity. Its mattifying qualities help restore your skin’s velvety texture. My experience: The Avène Cleanance Purifying Mask looks like a creamy white paste but it’s packed with micro-beads that are perfect for light exfoliation. It goes on dry or slightly damp skin – I personally prefer the former as it makes for more in-depth scrubbing – and works in as little as 5 minutes (I normally put it on just as I get into a bath and rinse it away at the end!). I really enjoy the cooling and refreshing texture, which feels like the product is getting deep down into the pores and giving them a thorough clean, despite the only-5-minutes factor. 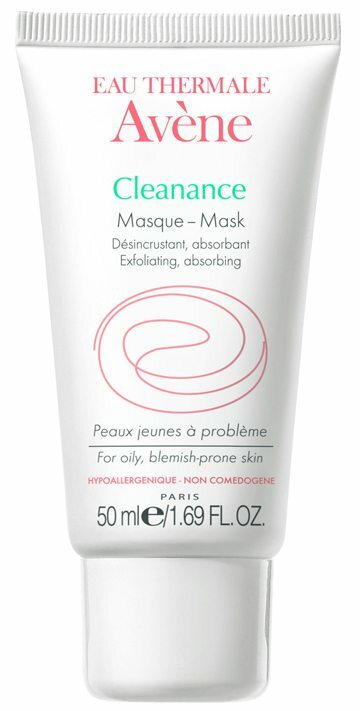 And thankfully, unlike most deep cleansing face masks, Cleanance doesn’t feel harsh or dry out my skin. That would be because of the Avène Thermal Spring Water, which soothes the skin and counters the drying effects of kaolin (white clay), glycolic acid and salicylic acid – all of which are potent weapons in the fight against oily skin, clogged pores and mammoth zits. My face looks just a little red after washing away the mask (I guess that’s because of the exfoliating micro-beads), so I wouldn’t advise using it right before you have to step out. In fact, it’s better to use this one at bedtime so your skin has the time to calm down. My skin does feel grease-free for a few hours afterwards, although how long it lasts depends on the weather. Avene recommends using this once or twice a week but with the humid weather we are having at the moment, I am using it around three times to really keep the oil production at bay. And even though I did not immediately see a huge improvement in the pore situation, over the period of a month my skin definitely feels smoother and nicer. The claim: Paraben-free TriAcneal helps eliminate severe imperfections while smoothing your skin. Effectiose, a patented innovation from PFDC Research Center (France), regulates the influx of irritating substances at the follicle level. Glycolic acid helps to peel away impurities, while Retinaldehyde regulates the formation of skin flaws and prevents residual marks. The soothing effects of Avène Thermal Spring Water provide the skin with a feeling of instant comfort. My experience: This is the product that I was most sceptical about, so I roped in a friend for a second opinion. Which turned out to be a good thing since TriAcneal can be applied in various ways depending on what you want out of it: as a thin layer all over the face every night if you have medium to severe acne; or as and when needed if you have mild spots. What excites me the most is TriAcneal’s retinoid content, which is not so easily available in over-the-counter formulations. But for this reason, one also has to treat such a potent product with respect. A non-negotiable: you absolutely NEED to apply sunscreen every single day as retinol and salicylic acid make the skin even more susceptible to sun damage. So, why retinol? And what is retinol? Retinol is basically a topical formulation of vitamin A in its purest form. It steps up exfoliation (and hence skin renewal), which works well for both acne control and anti-aging. Retinol also controls oil production and skin thickening, thereby making pores appear smaller. Plus, it helps rid the skin of acne-causing bacteria, lightens discoloration, smoothes skin texture and boosts collagen production, which in turn increases skin’s firmness and elasticity. However, even retinol has it’s drawbacks. It can cause a flare-up of symptoms if you suffer from rosacea, excessive dryness and other sensitivities, so steer clear of TriAcneal if you fall in that category. In TriAcneal, the retinol is joined by efectiose to reduce inflammations and glycolic acid, a powerful exfoliant, to further smooth skin’s surface. This delivers a potent 1-2-3 punch that not only minimises acne but also helps reduce residual marks and scars, while simultaneously providing anti-aging benefits. Does it sting? For me, it does have a tiny bite, meaning it tingles a little but only for a second. Definitely not stingy enough to be a deal breaker. Bonus: unlike many other retinol or glycolic acid based spot treatments, TriAcneal did not irritate my skin. I had no dryness or redness either. I guess that’s again because of the Avene Thermal Spring Water. However, my friend experienced a ‘purging’ effect, which is where a lot of spots appear as your skin draws dirt from deep down and uproots under-the-surface clogs. This cleanses the skin really well and gets rid of the bacteria that would eventually cause zits. The purging happened during the first week but after that her breakouts started subsiding, leaving behind calm, clear skin. Since there is really no way of knowing which camp you would fall into, it’s better not to start using this cream just before a major event. Despite the slight sting, TriAcneal is one of the very few acne products that genuinely help with my breakouts. While I haven’t noticed much difference in blackheads, it works well on those ghastly under-the-skin zits that take forever to come to a head and often hurt like hell. Till now, the only thing that worked for these subterranean pimples was my trusted Prid’s Drawing Salve or hot-and-cold compresses; TriAcneal now joins the arsenal. Avène recommends that you only use TriAcneal once a day and I have been doing that at night. Actually, I don’t see how you could use it during the daytime because of the sun sensitivity issue plus the fact that it dries to a slightly yellow tint on the skin. Oh… and do be careful if you have white or light coloured pillow cases as the colour does transfer a bit! Have you used Avène products earlier? What’s your secret skincare saviour? Do tell… we could all do with the help! Hello 🙂 I have tried Triacneal but it was too drying for my sensitive skin. Do you recommend mixing triacneal with a moisturiser such as topicreme?